2. In the bowl of the mixer place the sugar and butter and cream until soft and fluffy. 3. Add the yolk and vanilla and continue to mix until completely incorporated. 4. Slowly add the flour and mix until all combined. 5. You can take teaspoon fulls roll into ball and place on an ungreased baking pan or use a #100 scoop. Using the back of the tines of a lightly floured fork flattened the balls. 6. Place into the preheated oven and bake for 28 minutes until they begin to lightly brown. Remove to a wire rack to cool and once cooled can be stored in an air tight container for up to 2 weeks, but don't worry they won't last that long. 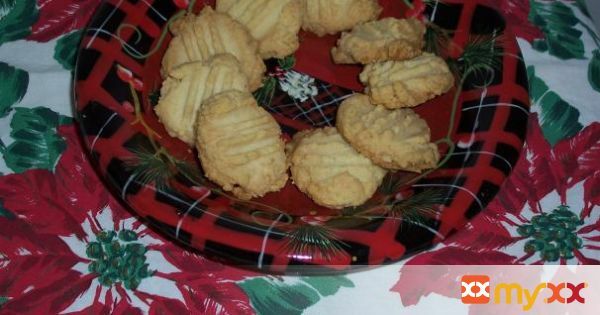 This recipe yields about 75+ cookies.